I decided to do this at the last minute and have done no planning at all — literally fifteen mintes ago I was still trying to decide whether to do insects or buildings or maybe birds again — but I thought it would be nice to start with a picture I took myself, so here’s The Herald, Scoliopteryx libatrix, as seen in my own garden. I think it’s rather pretty, by little brown moth standards, with those orange and white details. And while it’s not the most extraordinary example of insect camouflage ever, at the back it genuinely looks like a dead leaf. So why’s it called a herald? There are all kinds of little brown moths with surprising names: the Flounced Rustic, the Satin Lutestring, the Anomalous, the Conformist, the Confused… I can only assume that Victorian entomologists were making a game of it, to be honest. 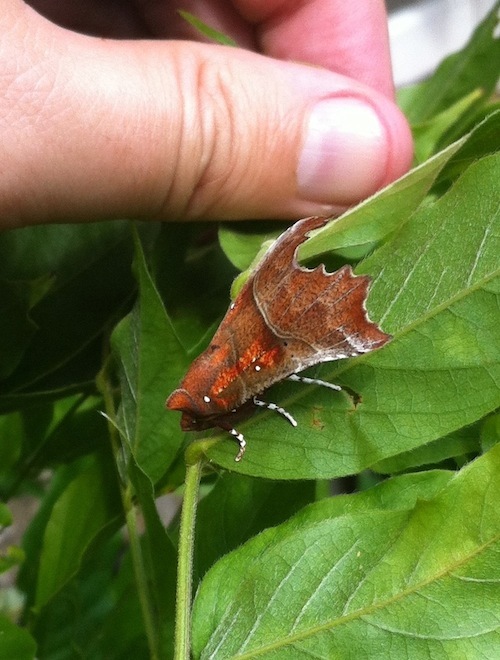 Mmm, moths are in many ways more interesting than butterflies, and obviously more elusive. I rather like the name ‘oak eggar’.